I used the long weekend to catch up on some movie watching, and I watched TWO movies in two days. Maybe I'll even watch another one tonight, if I'm feeling crazy. As a big fan of Edgar Wright and Simon Pegg's Shaun of the Dead, I'd been looking fo rward to seeing Hot Fuzz for a while. It did not disappoint. Hot Fuzz does for action movies as Shaun of the Dead did for zombie movies, only more so. Besides being everything a satire should be, it was also a virtual who's who of British actors and actresses. As a self-professed Anglophile, I found myself frequently distracted from the movie because I kept thinking, "Hey, there's Tim from The Office. There's Jim Broadbent. There's..." and so on. Even Timothy Dalton, who I generally only think of as my least-favorite Bond, hams it perfectly here. It's honestly pretty rare that I laugh out loud at a comedy, but I did so frequently here. Definitely worth checking out if you haven't done so already. I won't go into many details about WALL-E, if only because Clyde Squid just posted a review of this movie over on his other blog. I'll just say I agree with his assessment--it's a fun flick, not that I expect anything less from Pixar. This also happens to be the first movie my son ever watched, which is kinda cool. I honestly can't believe he sat still long enough to watch this from beginning to end; his attention span doesn't usually last more than 15 minutes. By the end of the movie, he was yelping "Wall-E! Wall-E!" My little nerdling. 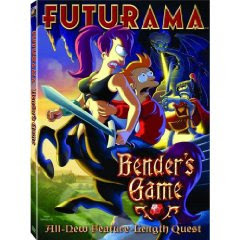 Watched the latest Futurama movie the other day, "Bender's Game." Despite the title, the movie is not a spoof of Ender's Game, which probably would have been a little too nerdy even for Futurama fans. It's really a send-up of Dungeons & Dragons, which is just nerdy enough, apparently. There is an inherent problem with all of these Futurama movies, but it was never more evident than in this one. These "movies" were written so they could be broken up into 4 distinct episodes and broadcast on TV. That's a less-than-ideal way to create a cohesive story. The other two movies pulled it off reasonably well, but this third installment felt a bit more slapped together. What you get is something closer to the "Family Guy" style of writing--essentially a string of pop culture references held together by thinnest of story lines. I mean, the plot development that dumps the cast into a fantasy (as opposed to sci-fi) dimension makes no sense at all. The ground literally opens up, they fall through the crack, and suddenly they're in a land where Leela's a centaur and Farnsworth's a wizard. They're conveniently in the fantasy dimension for about 22 minutes. This major complaint aside, I did chuckle out loud a number of times, just as I chuckle through Family Guy sometimes. I'm a sucker for pop culture references, but I've come to expect a little bit more from Futurama. The writers (and there were a lot of them for this movie) seemed to have phoned it in a bit here, which is unfortunate. Apparently there's yet another movie coming out--I believe there were originally supposed to be three--so maybe they'll try a little harder next time. Since Clyde Squid did a BSG post on his other blog yesterday, I thought I'd mention that I finally finished watching the 3rd season this past weekend. I've finally caught up enough to be way behind again! All I can say is that I enjoyed the entire season immensely, but that last two part episode blew my frakking mind. I've never been a huge fan of court room dramas (I'm pretty sure I'm the only person in this country who's never seen a single episode of "Law and Order"), but that was some trial. I'm not a huge fan of Apollo's character, but his rehashing of all the appalling things that various other characters had done over the past few seasons was incredible. And Baltar's exclamation after Gaeda's testimony may be one of my favorite lines of the entire series: ""The whole fleet knows this man tried to stab me through the neck. And you missed! Butterfingers!" Shite...I still laugh every time I think about it. Anyway, I realize all of this is old news to you guys. Obviously I don't want any spoilers, but does the show continue to hold up in the next season? Season 4.0 arrives in mid-January. I know very, very little about architecture. I approach architecture the same way I approach many types of art about which I have little to no formal education: I either like it or I don't. Well, except for one general personal rule--the architecture I like must not sacrifice form for function. That said, I generally just don't think about architecture all that much, unless it's a building I work in or something exceptionally striking. The building I work in now is not much to look at and has some flaws, but for the most part I enjoy working there. 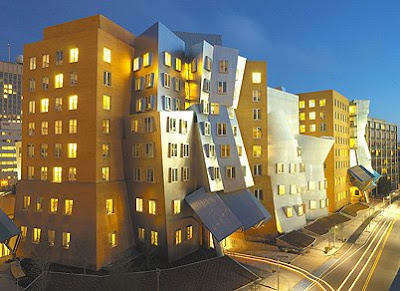 The Stata Center, home to MIT's Computer Science Department and AI laboratory, is exceptionally striking. It's about two blocks from where I work and I walk by it nearly every day. Then, when the novelty began to wear off, I began to wonder if it's actually just an eyesore. Then I got pretty used to seeing it on a daily basis, and I mostly thought of it as a helpful landmark. "Just take a right at the Crazy Building and you're there." But up until today, I'd never actually been inside the building. Now I have a new opinion of the Stata Center. This is the worst effing building I've ever entered. The professional reviews of the building have been mixed from the beginning, and much has been said by people smarter than me about how "uncomfortable" the building is. Have you ever imagined walking through an M.C. 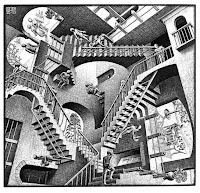 Escher drawing? Does that sound cool to you? Really? I mean really close your eyes and imagine it. Oops, did your stomach just lurch a little bit? Welcome to the Stata Center! Here was my experience today, briefly. My boss, a colleague, and I decided to go to a seminar that happened to be in the Stata Center. I was pretty pumped to finally see the inside of the place. Upon walking through the front door, I found myself at the bottom of a psychedelic canyon. There were no 90 degree corners to be found. The walls slanted away and in many places went up a few stories to a variety of convoluted ceilings. It was all kind of a blur until the elevator. On the elevator, my boss, who went to MIT, told the story of a friend who had a job interview on the second floor of this building and was half an hour late because he couldn't figure out how to get to the second floor. Sure enough, I looked at the elevator buttons and there was no "2" to be seen. We went from L to 3 in one swoop, bypassing the mythical second floor completely. These walls actually lean inward, and were covered with a disconcerting grid of spots that probably had to be there to improve the acoustics in this unfortunately-shaped room. I soon discovered that if my eyes strayed too long from the screen or the speaker, I started to feel woozy. I have never experienced vertigo or claustrophobia, but this room made me feel a little of each. Upon leaving the seminar (which luckily was interesting enough that my eyes seldom strayed from the screen), we decided to take the stairs down to the ground floor. There was a staircase right in front of us as we left the room, and we took it down to the fantastical 2nd floor. Upon doing a 180 at the bottom of the stairs to find the next flight down I found...nothing. A wall. Where were the stairs to the ground floor? I turned around to see that I had three choices: a hallway to my left, a bizarre twisty catwalk, or, hey a flight of stairs off to the right! Naturally we took the stairs down to...nothing. We found ourselves on a platform halfway between the 2nd and 1st floor that had no discernable egress. No more stairs, no doors. Not even a chair to sit on. There was a railing you could peer over into the cafeteria, in case you like to look at the tops of people's heads while they eat, but that was it. So we went back up the stairs and made our way over the twisty catwalk, where we eventually found the next set of stairs, essentially on the other side of the building, to get to the next floor. WTF? Not to sound all Mr. Safety, but how the hell did this place pass fire codes? My colleagues and I are not stupid people, and yet it took us several minutes to figure out how to make a trip that should have taken 30 seconds. 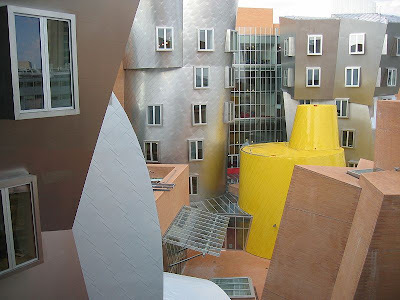 The bottom line is, the Stata Center is the most pretentious pile o' crap I've ever seen or experienced. I can't imagine the poor people who have to work and study in it every day. I suppose they get used to it eventually, but you shouldn't have to gradually grow acclimated to the building you work in, at least not to this extent. And I haven't even gone into the fact that the building is barely even structurally sound--MIT sued Gehry last year for all the problems they've had with the building's integrity. What a disaster. Please someone, direct me towards a building in the Boston area that will erase this nightmare from my memory.